Bali is the island of thousands of temples. There are literary temples everywhere in every nook and corner of the island, not to mention the small one in most households. Even though it is very easy to find temples, but you can never find the one like in Lempuyangan Temple. Known as the Gates of Heaven Bali, Lempuyangan Temple has the most magical view of two huge temple gate and mount Lempuyang and clouds in the background. 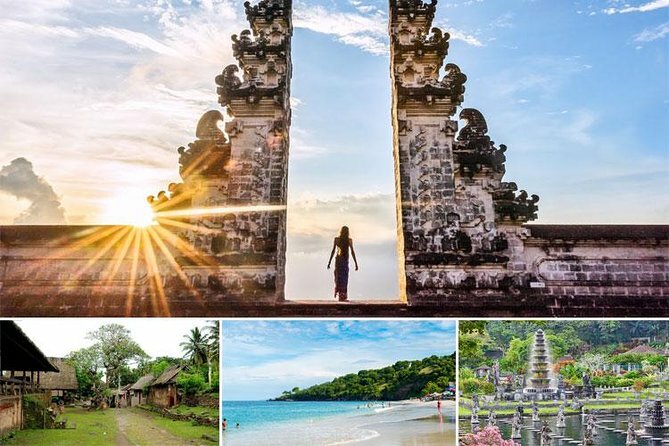 The Gates of Heaven Bali tour include a visit to four places which are Lempuyangan Temple, TirtaGangga Water Palace, Virgin Beach and Tenganan Ancient Village. It is a fully private tour. The sacred temple is located in the slope of Mount Agung and it has the most spectacular view. There are a total of seven temples in the complex of PuraLempuyangan and divided into the lower and upper level. The upper-level temple offers the most magnificent view with the background of Mount Agung. T Most people visit the temple to get a magical picture of PuraLempuyangan. You can get extra beautiful scenery when visiting early in the morning to get sunrise or late in the afternoon for the magical Balinese sunset.